While shopping for Christmas gifts this December, I came across a book entitled "Worn." It's a collection of stories by famous personalities about special garments that have become part of their life. It got me thinking about the clothes that people wear and how so many of them must have amazing stories to tell. I have, for example, kept a special sleeper or pair of socks from my children, when they were infants. In fact I still have the outfits my two youngest wore when they left Guatemala to fly to Canada, after their adoptions were completed. These are transition garments. They tell the story of who they were and where they came from. I have also kept the sweater my mother knit for me when I left home in my early twenties to live in England and travel through Europe - another transition story. Then there were the prom dresses that I couldn't keep, along with the school uniforms and their badges, plus that favourite hat. Many women, I know, keep their wedding gowns - costumes for the play that's about to begin. Men keep their uniforms - statements of who they are. Parents, as I have said, keep their children's clothes - a way of holding onto the passing years a little longer. Garments, it seems, have a life of their own, the years adding chapters to their stories. What happens, though, when an item wears out? If there is very little left of the original piece to keep, is its story over? Oh, I know there are some very worn items in museums here and there - delicate lace Christening gowns, classic fishermen's sweaters, beautifully embroidered hats, mittens and gloves. However, some of the most meaningful pieces are the ones that never make it to the likes of the Smithsonian. They are those special garments in our own closets and drawers. The pictures are of a sweater I knit for my husband about ten years ago. I have actually thrown out sweaters that I have knit for him, because they have been too worn to mend. I guess in a way their stories are over. Although in a weak moment I have been tempted to re-knit them. Would their story then continue? 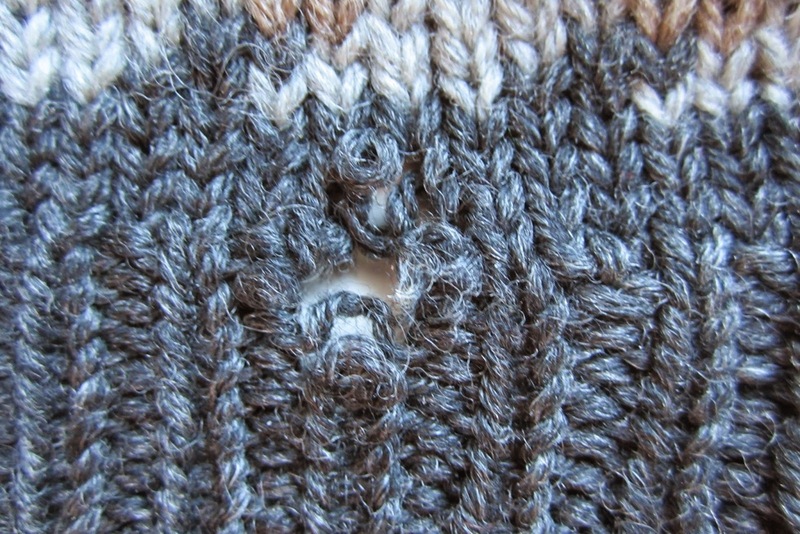 This sweater, though seriously frayed, can be mended. 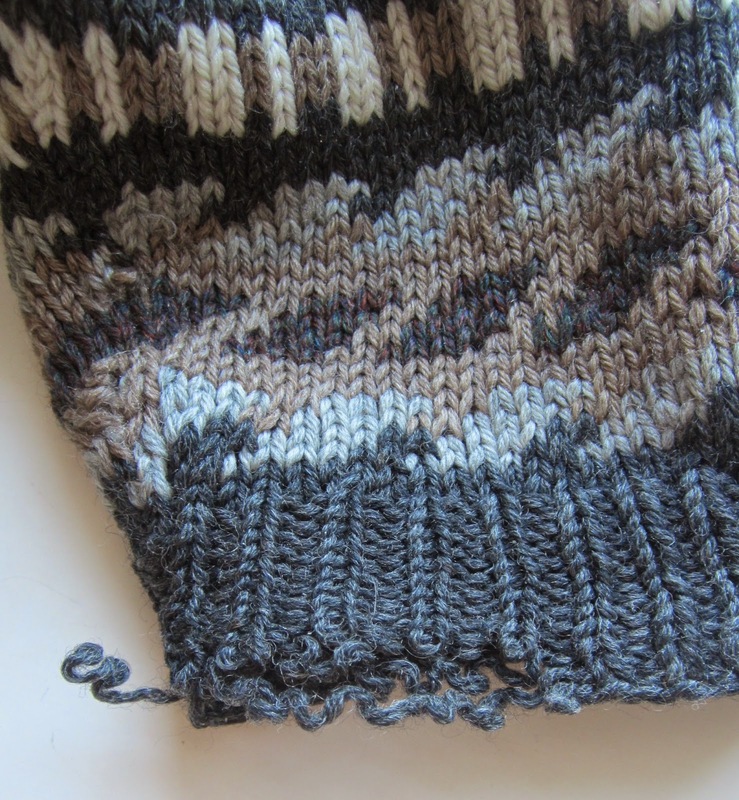 I will reknit the cuffs and the ribbing, as well as, new patches to cover the holes at the elbows. This should shore it up for another few years, enough time to add a few more pages to its story. Please tell me your favourite clothes story. Thank you, Elaine. Yours is a lovely story. Hand crafted gifts are so precious.